During the PNEC 2015 conference last week, we managed to entice some of the attendees, passing by our booth, to take part in a short survey. As an incentive we offered a chance to win a prize and made the survey brief, we could’t make it too long and risk getting little or no intelligence. I’m not sure if any of you will find the results to be a revelation or offer anything new that you already did not know anecdotally. But if nothing else, they may substantiate “feelings” with some numbers. You will be pleased to know that more than 60% of the replies are from operators or NOC. In this week’s blog I share the results and offer my thoughts on the first survey question. 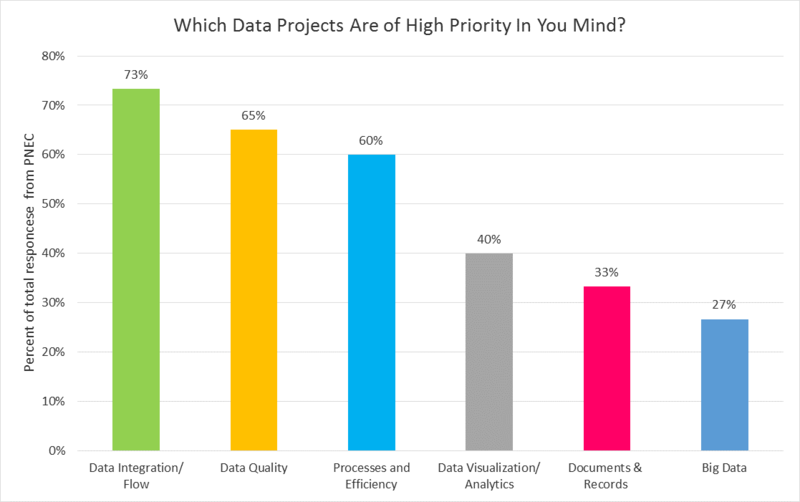 In the above question and graph “Which data projects are of high priority in your mind?”, it appears the industry continues to pursue data integration projects and the majority of the participants (73%) consider them to be the highest priority. Followed closely on the priority list were “data quality” projects (data governance and legacy data cleaning), 65% consider these a priority. Integration will always be at the top of the priority list in the E&P world until we truly connect the surface measurements with the subsurface data in real time. Also, given that data integration cannot be achieved without pristine data, it is no surprise that data quality follows integration as a close second. Because many “data cleaning” projects are driven by the need to integrate, data quality efforts are still focused on incoming data and mostly on “identification” data, such is the case in MDM projects. Nonetheless, how a well was configured 20 years earlier and what failures (or not) were encountered during those 20 years are telling facts to engineers. Therefore, the quality of “legacy” technical data is just as important as of new incoming data. Reaching deeper than identification and header data to ensure technical information is complete and accurate is not only important for decision making, but as my friend at a major company would say: it is important firstly for safety reasons, then for removing waste (lean principle) and then for decisions. Of course chipping away slowly at the large mountain of data is a grueling task and can be demotivating if there are only limited results. To get them done right with impactful E&P business results, these projects should be tackled with a clear vision and a holistic approach. As an industry we need to think about legacy data preparation strategically, do them once and be done with it. Legacy data cleanup projects are temporary (with a start and an end date), experience tells me they are best accomplished by outsourcing them to professional data cleaning firms that fully understand E&P data. This blog is getting too long, I’d better cover the results of the rest of the survey in the next one. Please share your thoughts and correct me where you feel I got it wrong…. This entry was posted in Data Quality, Digital Field, Document Management, Information Management, Integration and tagged data cleaning, data management, Oil & Gas Data Management on May 31, 2015 by Certis Inc..
well; 2014 is ending with oil prices down and an upward trend on M&A activities. For those that are nearing retirement age, this is not all bad news. For those of us that are still building our careers and companies, well, we have uncertain times ahead of us. 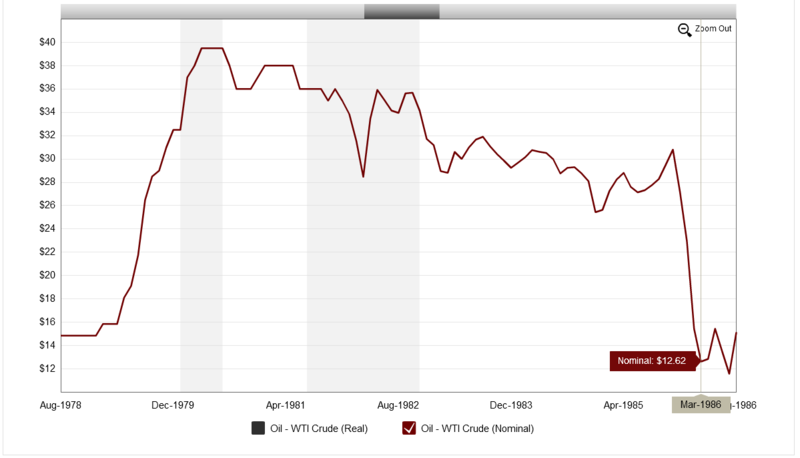 This got me asking: is it a double whammy to have most knowledgeable staff retiring when oil prices are low? I think it is. At the very least, companies will no longer have the “fat margins” to forgive errors or to sweep costly mistakes under the rug! While costs must be watched closely, with the right experience some costs can be avoided all together. This experience is about to retire. For those E&P companies that have already invested (or are investing) in putting in place, the right data and processes that captured knowledge into their analysis and opportunity prioritization, will be better equipped to weather low prices. On the other hand, companies that have been making money “despite themselves” will be living on their savings hoping to weather the storm. If the storm stays too long or is too strong they will not survive. Blanket cost cutting, across all projects is not good business. For example some wells do not withstand shutting down or differing repairs, you would risk losing the wells altogether. Selectively prioritizing capital and operational costs with higher margins and controllable risks, however, is good business. To support this good business practice is a robust foundation of systems, processes and data practices that empower a company to watch important matrices and act fast! We also argue that without relevant experience some opportunities may not be recognized or fully realized. If you do not have this already, consider implementing a system that will give you a 360 degree view of your operations and capital projects. Systems like these need to have the capability to bring data from various data systems, including spreadsheets. We love the OVS solutions (http://ovsgroup.com/ ). It is lean, comes with good processes right out of the box and can be implanted to get you up and running within 90 days. When integrating systems you may need some data cleaning. Don’t let that deter you; in less than few weeks you can get some data cleaned. Companies like us, Certisinc.com, will take thousands of records validate, de-duplicate, correct errors, complete what is missing and give you a pristine set. So consider outsourcing data cleaning efforts. By outsourcing you can have 20 maybe 40 data admins to go through thousands of records in a matter of a few days. Many of your resources are retiring, consider hiring retirees, but if they would rather be on the beach than sitting around the office after 35+ years of work; then leverage systems like OGmentorsTM (http://youtu.be/9nlI6tU9asc ). In short, the importance of timely and efficient access to right & complete data, and the right knowledge weaved into systems and processes are just as important, if not more important, during skinny margin times. Good luck. I wish you all Happy Holidays and a Happy 2015. This entry was posted in Data Quality, Digital Field, Document Management, Information Management, Integration, Knowledge managmeent, Process Improvement and tagged Knowledge management, Oil & Gas Data Management, Oil & Gas production, processes, retiring knowledge on December 11, 2014 by Certis Inc..